So blessed readers, there is no doubt this winter has been hard on much of the country. Even the huge avalanche that cut off the city of Valdez Alaska last month was considered extraordinary in an area not easily impressed by snowfall or for that matter avalanches. Ironically the Valdez avalanche was caused by the extreme cold in the lower 48 states shifting unusually warm air up into Alaska. We freeze and it sets off record avalanches in Alaska. Go figure. The Bedlam Farm Creative Group page has been full of spectacular winter photos (photo above by Anne Wilson Sweeney) and blog posts of hardy souls surviving sub zero temperatures as they go about their daily lives. There are signs our resolve is beginning to crack. A call for “random flower of the day” images filled the page with color and wistful poems about spring. One post featured a photo of a member’s pond in all its snow covered glory. 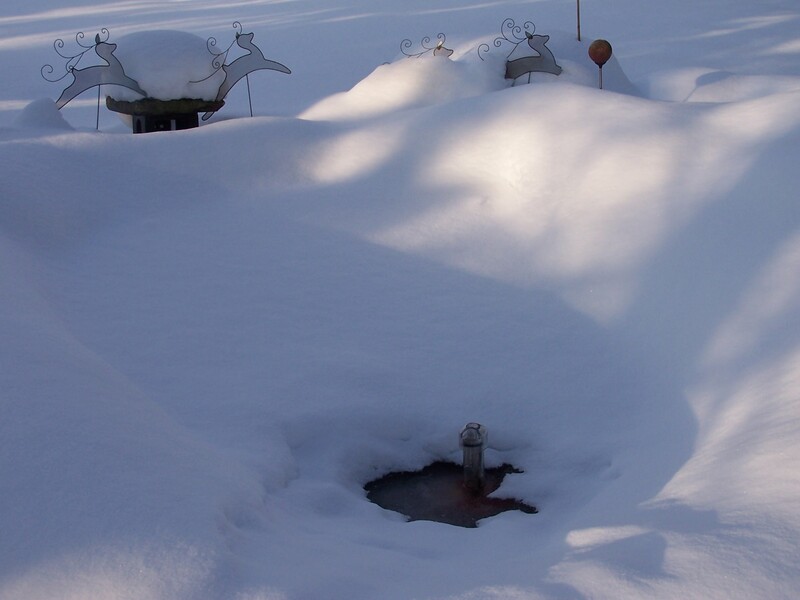 It prompted me to comment about how often I had to clear the snow around my own pond “percolator” this winter. The “percolator” goes in the pond early in November, when plummeting temperatures dictate shutting off the waterfall pump. As the surface begins to freeze, the floating disc holds the air exchange tube upright and prevents the ice from crushing the tube. The pump draws up a small amount of water, past a heat element which keeps the water from freezing as it drips back down the tube bringing life sustaining oxygen to the water below. Without this “percolating” water pump, the decomposition of organic material along with the slow respiration of the hibernating fish would gradually consume all the oxygen. 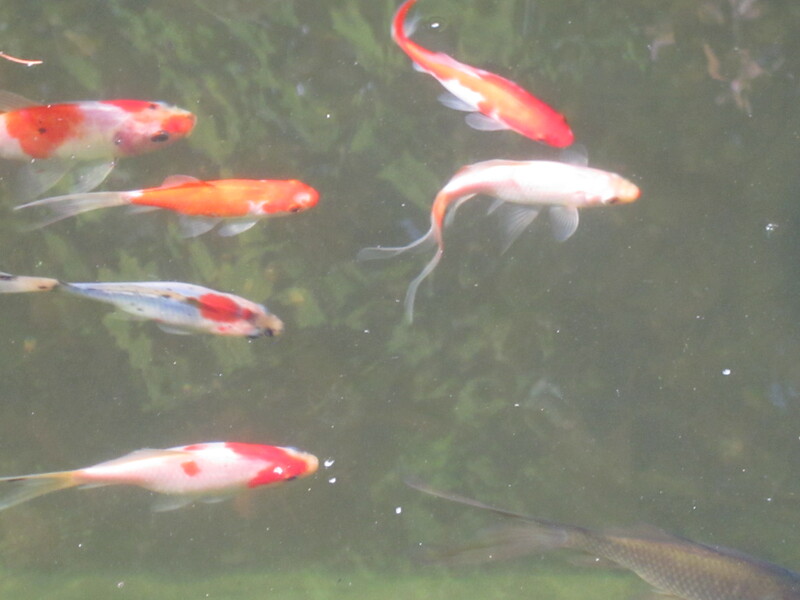 It seems to work fine, the pond is going into its sixth season with minimal loss of fish. How well I remember that first anxious winter. Helplessly I watched the pond freeze over, searching for flashes of orange under the ice. Soon even those reassuring signs of life were buried beneath several feet of snow. All I could do was carefully keep snow cleared from the top of the tube, checking to be sure the life giving trickle of water continued to flow. When spring temperatures finally brought a thaw, first one then another of the larger koi floated to the surface. On the third morning I went out expecting a new floater and was greeted by several small flashes of white and orange. Some of the fish had survived. I literally did cartwheels across the grass, something my knees quickly reminded me I had not done in over 30 years for good reason! In time I learned the best mix of flora and fauna to stock the pond with and a natural equilibrium was established. Each summer a new batch of little fry hatch and enough survive the deep freeze of CNY winter to maintain a healthy balance. Still, each year as the surface disappears beneath a blanket of white there is a brief flash of panic. It can take as long as 15 long weeks before the snow recedes to reveal a thick slab of ice. As this gradually lightens from opaque to translucent, I will watch anxiously for signs of life below. Often the first spot of color is just a random leaf , sometimes it is a dreaded “floater” which must quickly be removed to avoid contaminating what remains. Always there comes a day when a slow moving flash of white and orange signals we have a survivor. A wave of joyous gratitude washes over me, some how once again I have managed to safeguard a few precious lives through a deep, dark, frigid sleep. Hope is like that. We all have goals buried deep beneath the opaque layer of daily, mundane busy-ness, lost dreams driven to hibernation by years of frigid neglect and disappointment. Hope is the percolator filtering a life sustaining trickle of belief to keep our dreams alive until a flash of inspiration awakens them once again. Beautiful metaphor. …very good writing.